Sketch iluustrating grain flow lines due to cold work of rolling. The flow of the material by cold work during rolling reinforces the shape. The cold working strain increases mechanical properties, Surface Hardness,Tensile Strength, Yield Strength, and the Yield Strength / Tensile Strength ratio. The surface finish of the thread flanks is usually smoother due to the burnishing action of the rolls.Smoother finish means better fatigue life and fewer opportunities for stress risers. There is more material (section thickness). This results in material savings*, since the diameter of the blank will be between the major and minor diameter of the thread, rather than greater than the major diameter for a cut thread. 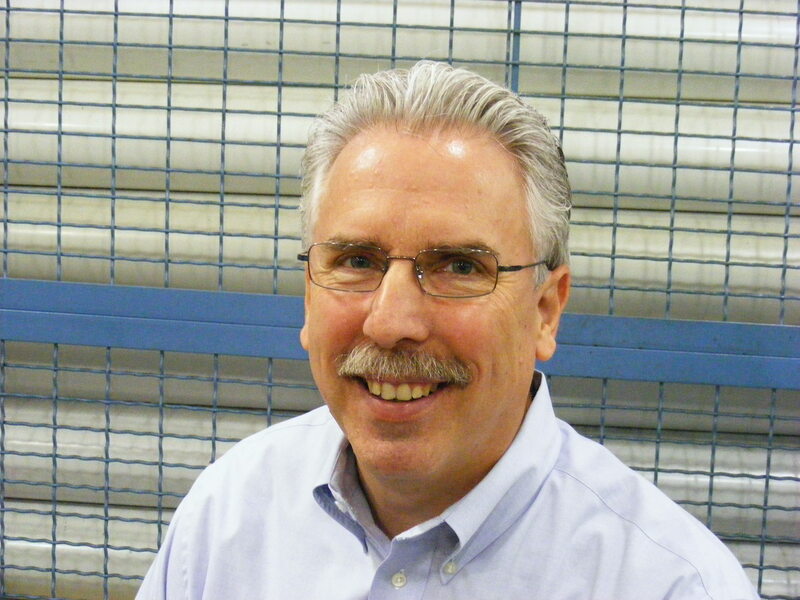 The compressive stresses on the threads resulting from rolling improves the fatigue life. The root of the thread has a smoother radius, improving fatigue life. 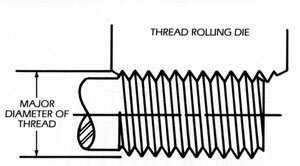 Schematic view of the thread rolling process. 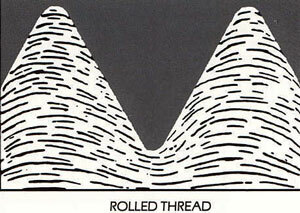 Click here for a video of the thread rolling process in action from PMPA member Rolled Threads Unlimited LLC. Blank diameter will be between major and minor diameter = $ Saved. This entry was posted on Tuesday, August 10th, 2010 at 4:43 am and is filed under Engineering. You can follow any responses to this entry through the RSS 2.0 feed. You can leave a response, or trackback from your own site.